Tropical Parasitology (TP): As an eminent member of various prestigious organizations, please share your views and experiences in parasitology. Prof. Aparup Das: Diseases due to various parasitic infections (both in human and animals alike) are very much prevalent in the tropical and subtropical regions of the globe. It is therefore, many developing and underdeveloped countries are in hugely burdened with parasitic diseases. Parasites, like any other living organism, being simple in genetic and physiological architecture need a host, and therefore, they always try to utilize host machinery for their own survival and reproduction. To alleviate parasitic diseases, in my opinion, it is highly essential to understand in-depth basic mechanism of the host–parasite interactions specific to different parasites both at cellular and molecular level first, which will not only aid to prevent parasitic infections in human and animals but also to block transmission of these diseases in the population and community. TP: As malaria is one of your specialized areas of research, please shed some light on the current trends in malaria. Prof.Aparup Das: Malaria is a parasitic disease to human and many domestic and wild animals. In human, it is caused by five different species of the genus Plasmodium, which are transmitted in the community by mosquito bites. It follows a classical triangle, host (human and animals)–parasites–vector, highly influenced by the local environment. Therefore, its manifestation and epidemiological outcome are highly local and focal. In human, malaria poses a huge public health burden in all over the tropical and subtropical countries of the globe. In spite of large-scale and in-depth research, malaria still has been a threat to humankind. Over the years, due to smartness on the evolution of malaria, parasites for resistance to different drugs used in the field and resistance to insecticides in the vector of malaria parasites have put huge challenges in controlling malaria. In the absence of an effective vaccine, controlling malaria is getting difficult at a global scale although some countries (e.g., Sri Lanka) have recently achieved the laurels in eliminating malaria. All over the globe, the parasite Plasmodium falciparum (the deadliest form of malaria) is on the constant rise and also infections due to two or more parasites (mixed species infection) in a single individual. Furthermore, cases of severe malaria caused by Plasmodium vivax (which was otherwise known as benign malaria) are also emerging. All these aspects make malaria as a complex parasitic disease of humankind and need to be intervened from different angles. Not only laboratory-based research is important for developing new drugs and vaccines, but also new methods of vector control, community sensitization through awareness generation communities, and strong political commitment will surely be able to cut down malaria cases significantly. TP: What are your other areas of interest in parasitology research? Prof. Aparup Das: Malaria is my cup of tea. 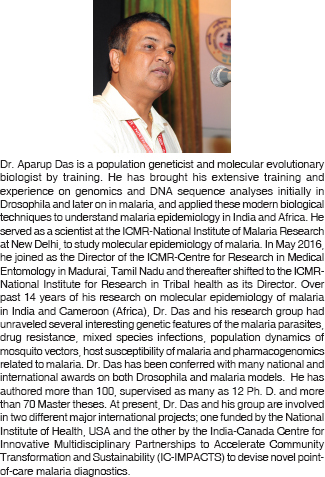 I have come to malaria research after extensive work on genetics and genomics of the model organism, Drosophila during my doctoral and postdoctoral work at the Banaras Hindu University, Varanasi, India, and Ludwig Maximilians University, Munich, Germany, respectively. I have utilized my understanding of genetics and genomics from Drosophila into malaria research in India and Africa and continued to work on malaria. As per my understanding, malaria is the most complex among other vector-borne infectious diseases, and if we understand the genetic and biological phenomena of malaria governing pathogenesis, drug and insecticide resistance, and transmission dynamics, we will be in a position to tackle other newly emerged vector-borne diseases quite easily. TP: Please share your work experience in evolutionary genomics of malaria and their applications. Prof. Aparup Das: We are a product of evolution. Principles of evolution proposed by Charles Darwin and other seminal workers are applicable to every organism independently and also in a network involving interactions among different organisms in a disease system, like malaria. The field of evolutionary genomics has been lucrative to understand not only the historical changes in population size due to migration, mutation in genes, and genetic drift but also several important genes in organisms responsible for survival and fitness evolved through natural selection for adaptation in a specific environment. In parasitic diseases, e.g., in malaria, understanding such process at the population genetic level is important as the process of evolution of pathogenesis and drug resistance in parasites and insecticide resistance in malaria vectors governs to this principle of evolution. Employing modern technologies such as genomics and analyzing genomic data using bioinformatics to understand “processes” from the observed “patterns” of DNA sequences in field populations enlighten us to understand the epidemiological outcome in malaria. These basic understanding will lead us not only the basic inferences on the evolution of genes leading to evolution in pathogenesis or resistance to drugs in parasites, but the information can also serve to utilize in deciding on the candidate gene to target for vaccine and drug development in malaria. Furthermore, whether certain kind of intervention (e.g., drugs, bed nets, vaccine) really works can also be monitored through evolutionary genomic techniques. TP: Why is drug research in parasitology lagging when compared to the development of antibacterial or antiviral agents? Prof. Aparup Das: I see that the major reason for this is the enormous diversity in genes of parasites, translated to phenotypes. As mentioned before, malaria is an age-old disease and has been with humankind since time immemorial. Evolution has shaped the disease as we see now, and due to high genetic diversity that is confined to specific populations, a common drug for malaria would be ineffective across the globe. Second, the simple genetic architecture the parasites possess and the “clever” mode of changing the genetic architecture by the parasites, any effective drug (as developed in the lab) is very difficult to work in the whole endemic populations, or if works, the parasite would quickly develop resistance to that drug. It is not the fact that drugs are not developed for the treatment of parasitic diseases, but finding an “effective drug” is the principal impediment in the control of diseases. TP: Drug resistance in malaria has been rapidly evolving in the past decade. What is the current status of antimalarial drug resistance in India? Prof. Aparup Das: At present, the once-effective and golden drug of malaria is highly resisted by malaria parasite P. falciparum across all the endemic populations in India. Interestingly, however, P. vivax is still susceptible to chloroquine, which is a good news. Some cases of P. falciparum resistance to the sulfa-drugs, sulfadoxine-pyrimethamine are also reported from various endemic regions of India. The most currently used drug artemisinin in combined therapy is fortunately effective in India for the treatment of P. falciparum as no resistance (as identified genetically) has yet been reported from any malaria-endemic locations. TP: What is the current status and impact of the introduction of National Framework (2016–2030) and National Strategic Plan (2017–2022) for the elimination of malaria in India? Prof. Aparup Das: India is poised to set for malaria elimination by 2027 and sustain zero indigenous case for the next 3 years, meaning, by 2030, India should be declared malaria-free. TP: What are the hurdles faced in implementation of the elimination strategies in tribal or rural population? Prof. Aparup Das: Malaria is a major health problem in rural/tribal areas of the Central, Eastern and North-Eastern states, particularly in 16 states including seven northeastern states and nine states of Central India, which are majorly dominated by tribes. There are several factors that are responsible for controlling malaria in the rural and tribal-dominated areas in India. Difficult-to-reach areas (Forest, hills, valleys and perennial streams) and orthodox health beliefs are major impediments in putting intervention measures among people living in rural and tribal areas. The social and cultural practices (opting for village quakes instead of medical services, noncompliances of medicines) also come on the way for implementing many of the intervention measures for malaria elimination. TP: In your opinion, what newer perspectives can be addressed in these programs for eliminating malaria? Prof. Aparup Das: There are quite a few things comes to my mind. The malaria control program must design frameworks based on population/community-based approach not as a country on the whole. Epidemiological information of malaria varies greatly among states, communities and populations. The endemicity of vectors and their resistance to insecticides are few criteria which are to be considered while implementing community-based elimination programs. Results from evidence-based research must be thoroughly considered while devising methods for malaria control/elimination. An integrated approach in collaboration with state health system consisting of test, track, and treat of malaria in parallel with vector control strategies will be the best way, according to me. TP: Please share a few words of advice for the budding scientists in the field of parasitology. Prof. Aparup Das: A parasitologist should start with basic understanding on the biology, genetics, and mechanism by which the parasites are able to invade the host and cause a disease in a holistic approach. Many young scientists working in parasitology prefer to work on molecular aspect, but that is not the only way to understand the whole mechanism of parasitism. Like every organism, parasites invade hosts to survive and/or reproduce, or both. Therefore, basic understanding on (i) how the parasites invade the host immune system would lead to development and success of a vaccine and (ii) what are the essential pathways/genetic/physiological aspects of the parasites leading to their survival inside host would lead to the development of an effective drug.